I started with a piece of Ranger Watercolour paper cut to 4×5 1/4, and use Distress Ink in the colours, Peacock Feathers, Picked Raspberry, and Squeezed Lemonade. I put the inkpads on a ranger craft sheet and sprayed with water, after drying the first layer of colour, I tapped the piece back in the water to add some further layers, increasing the watercolour effect. 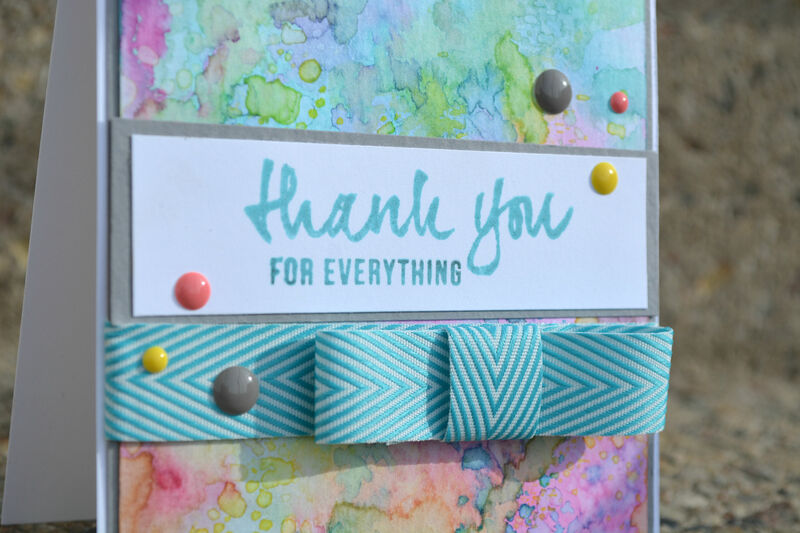 Then on a white panned I stamped the Thank you sentiment from the Avery Elle set, the for everything is from a SSS set called Life is a Journey. 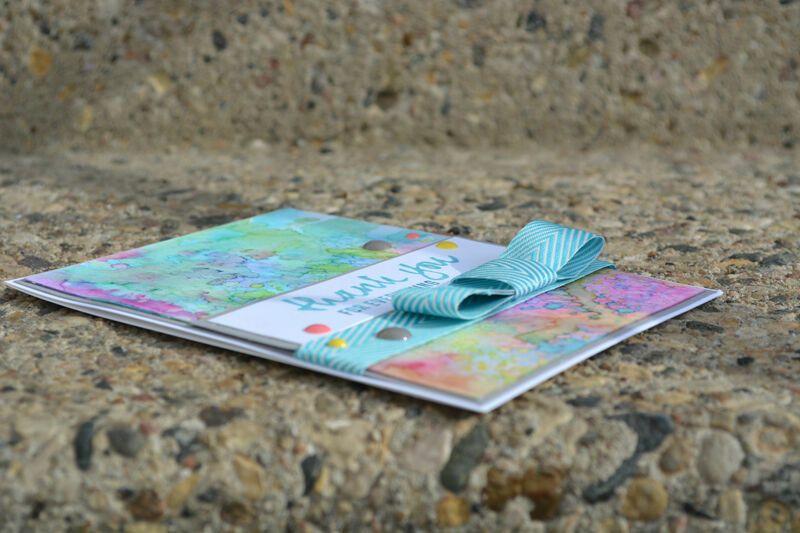 I then made a bow on the front of the card using May Arts Turquoise Twill Stripes ribbon. 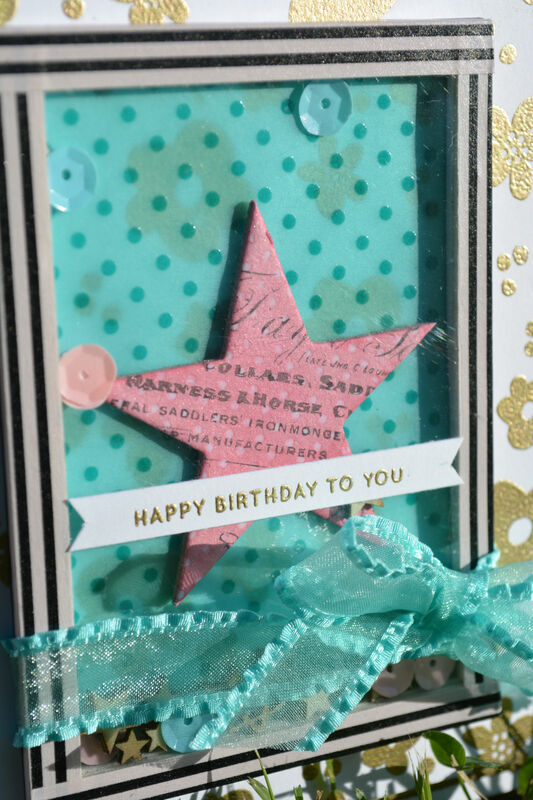 Added a few enamel dots from my stash in similar colours, put it all on a white card base and the card was complete! Quick and simple. Hey everyone, my sister is getting married this Saturday, so I made her a lovely little card, which also happened to fit the SSS Wednesday challenge. It all started with about 4 SSS stamp sets, Life is a Journey, Thinking of You, Handwritten Greetings, and Favorite Flowers. 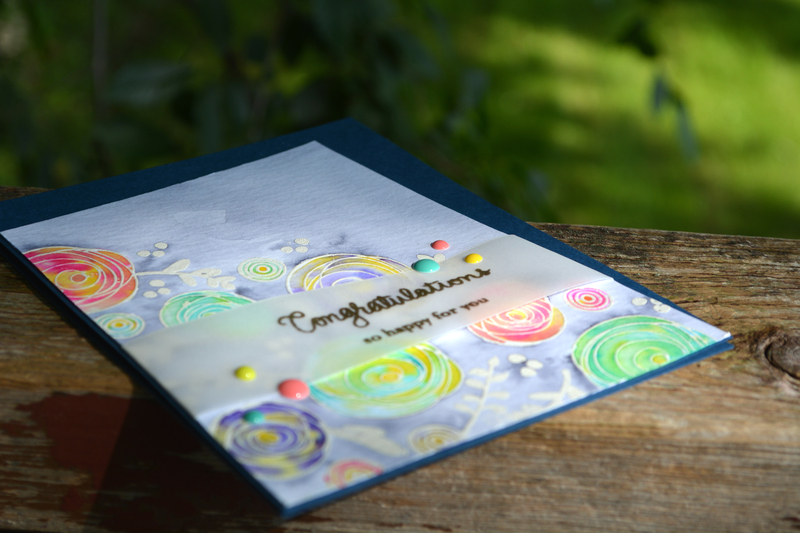 I embossed all the flowers and greenery in the backround using Hero Arts White Embossing Powder, on Ranger Watercolor Paper. Then it was all coloured with Peerless Watercolor Bonus Pack. 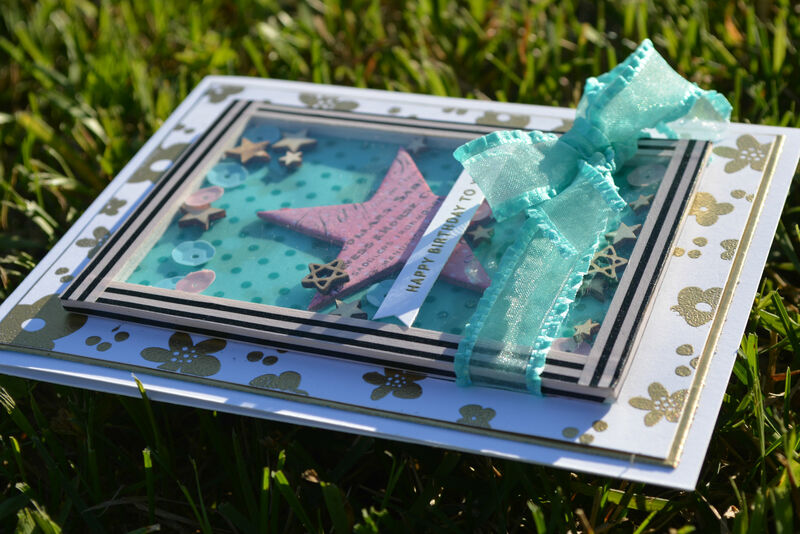 The sentiments were embossed on vellum with Hero Arts Gold Embossing powder. Hey everyone! It has been a while, I am hopefully going to be here and be blogging more frequently. But today I am here with a fun card!!! 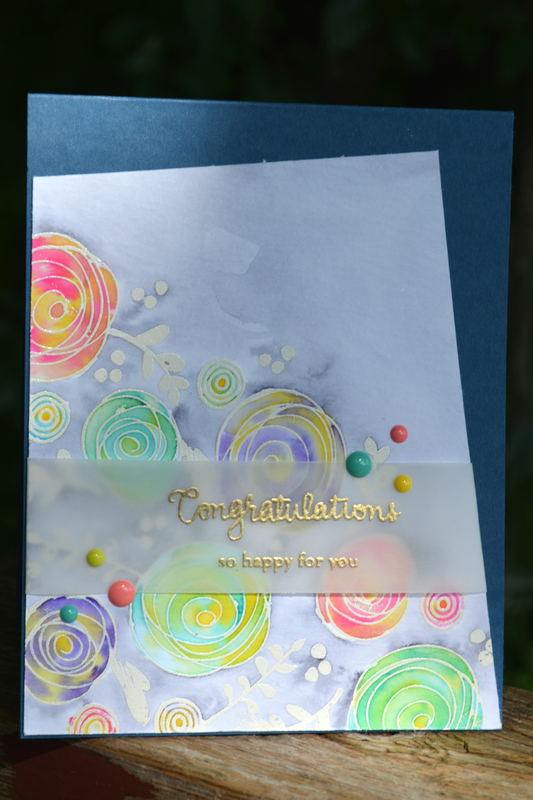 The back round of this card was made with Hero Arts Gold embossing powder, and the flowers from the SSS Life is a Journey stamp set, I then took a piece of card stock slightly larger and covered the edge of it in the gold embossing powder as well and layered it in behind. 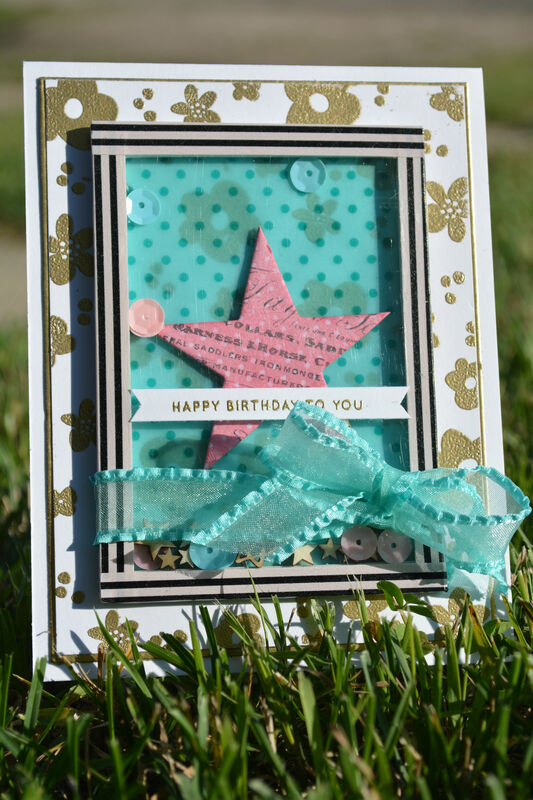 The shaker card was made using Doodle Bug Peacock Vellum, the large star inside is from Heidi Swapp’s Colour Magic star chipboard pieces (I don’t know if these are still available anywhere, I then filled the rest of the shaker card with Studio Calico tiny star wood veneers, and studio calico sequins in aqua and pink. To close the shaker I put a piece of acetate on tip and wrapped washi around to hide the foam tape, the washi tape is from an older My Minds Eye line. 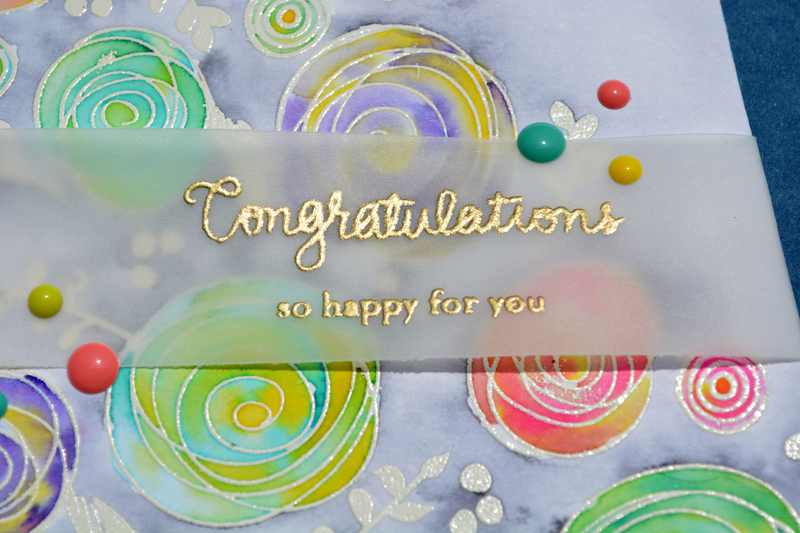 The sentiment is from SSS Birthday Messages stamp set, again embossed using the Hero Arts Gold embossing powder. I, then, cut a slit on either side of the shaker element and fed a piece of May Arts Sheer ruffle edge ribbon in turquoise and tied it in a bow.